We can thank the postal service for helping in the proliferation of honey bees. Every spring live honey bees are distributed across the country in small screened wooden boxes by postal workers. These packaged bees are used to establish hives, replace winter colony losses, and expand beekeeping operations. Packages of bees include a number of worker bees, usually three pounds, or around 12 thousand bees. The package also includes a mated queen bee housed in a small cage. The package of bees cannot be considered a colony; it is comprised of bees removed from numerous hives. When the bees are packaged, they are not familiar with the included queen, which was raised separately. It is only after the bees are exposed to the queen’s pheromones that the group organizes as a colony. During the spring, beekeepers across the country use packaged bees to expand their colonies. 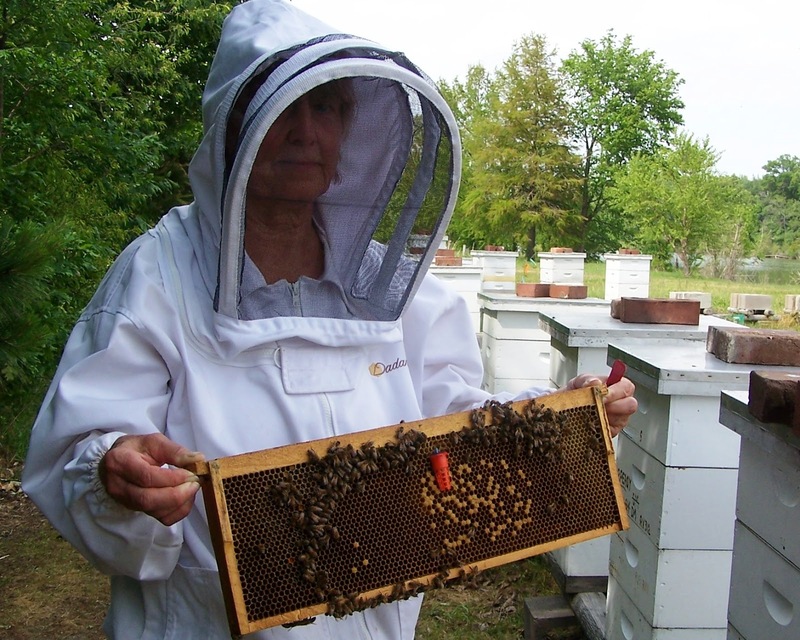 Procedures for installing packages of bees are taught at local beekeeping associations. 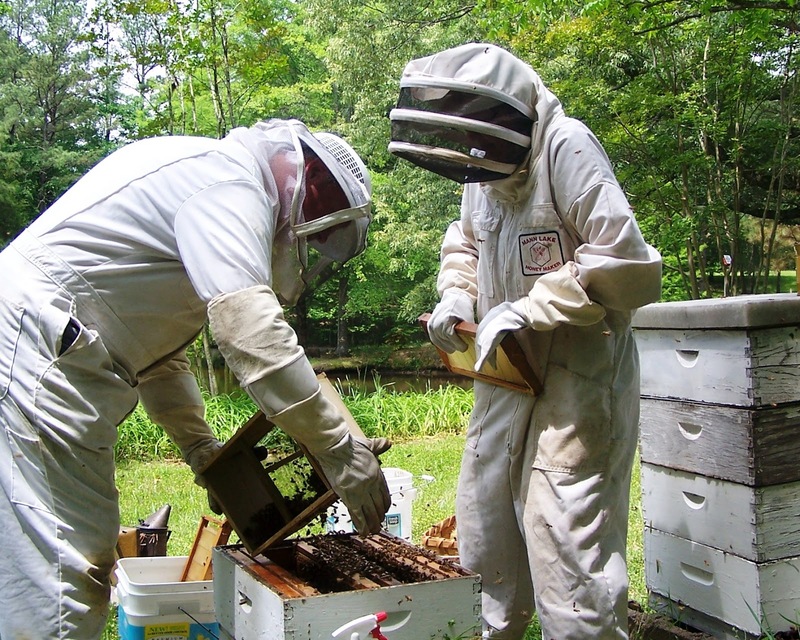 In today’s picture, Richard Hillis assists Agnes Stark install packaged bees in Agnes’ Arlington, Tennessee bee yard. Melissa Bridgman also assisted Nobuko Igarashi install bees at her Midtown Memphis home. Each group was successful in establishing their colonies using techniques they learned from the Memphis Area Beekeepers Association. They protected the bees when they received the packages by storing them in a cool, dark area until it was time to install the bees. They kept the bees from dehydrating by spraying a little sugar water through the packages’ screens. The beekeepers were careful to place the queen cages in the hive so that workers could access the screen around the queen to feed her until her release, and they positioned the candy plug so that the workers could access it. The time involved for workers to eat away the candy plug allows the bees to become accustomed to the odors and pheromones of their new queen. The beekeepers will wait about five days to check for the successful release of the queen. Honey bees reproduce on a colony-wide basis by swarming. Strong, healthy colonies divide to increase the number of colonies and expand into new territory. 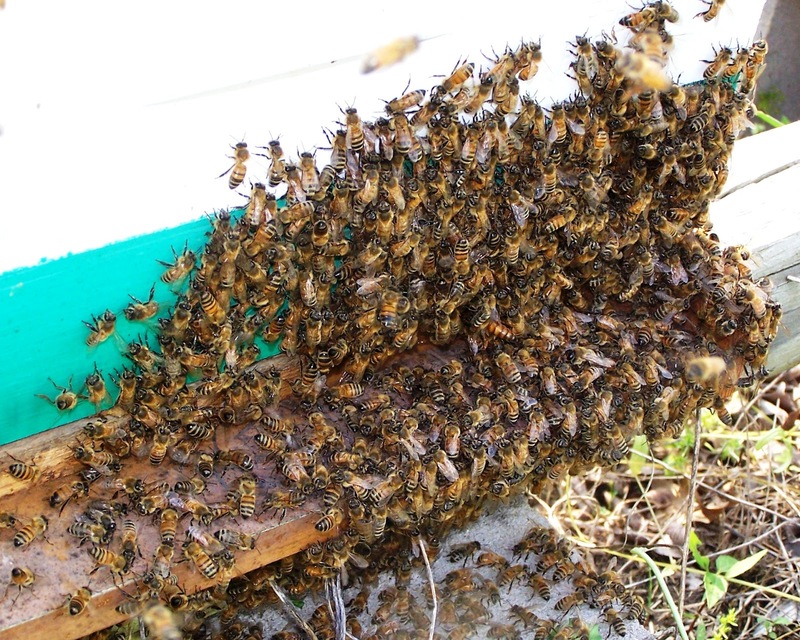 Swarming is not a safe move for honey bee colonies; it is often not successful. Swarms resting on an exposed tree limb while scout bees search for a suitable permanent nesting cavity may perish in a springtime thunderstorm. The cavity that the bees choose may prove to be unsuitable. However, reproduction on a colony-wide basis must be worth the cost. One benefit is surely the bees’ abandoning old nests and their combs that hold disease spores and environmental chemical toxins. Swarming keeps bees from being completely dependent upon cavities of old, rotting trees for testing places. While reproductive swarming is risky, honey bee colonies stand a chance of effectively doubling their numbers with each swarm. Before swarming, colonies produce a new queen to lay eggs in the old nest, giving the existing colony a fresh start with a productive egg layer to produce young. Beekeepers attempt to reduce swarming because it usually means a loss of honey production for the year or insufficient numbers of bees for pollination service rental fees. Most swarm reduction measures change the conditions that cause swarming or give the bees the impression that the colony has already swarmed. Today’s photo shows a swarm emitting from a Peace Bee Farm hive. The queen with her wasp-like abdomen is in the center of the mass of bees. If the swarm lights on a tree limb where I am able to catch it, I will have a tidy, though unscheduled, colony expansion. If it flies away, I will have increased the drones with good genetics in surrounding drone concentration areas. My beekeeping friend, The Luddite, caught a large swarm of over-wintered Russian bees from her Maine bee yard, effectively increasing her colony of winter-hearty bees. For honey bees, swarming may be their purpose in life; for the beekeeper, swarming should be a welcomed event. Beekeepers can establish or expand their bee yards by purchasing hives from other beekeepers, purchasing nucleus hives, dividing existing colonies, catching swarms, or raising bees in queen mating nucleus hives. Beekeepers trying to expand their bee yards start with small populations of bees. Often nucleus hives smaller than full-size hives are used for expansion. These hives are especially vulnerable to a number of pests. As each of these new hives builds in population it is subjected to attack from numerous pests. Weak hives are regularly approached by wasps, yellow jackets, hornets, wax moths, small hive beetles, and mammals. However, the most persistent attackers of bee hives are often worker honey bees from other colonies in the area that attempt to rob honey stores. The best defense against bee hive pests is a strong population of honey bees. Bees can drive away intruding wasps, yellow jackets, wax moths, dogs, and other mammals. They remove the larvae of wax moths, and drive adult small hive beetles to the corners of the hive. Guard bees trap small hive beetles in propolis “traps” that the workers build. 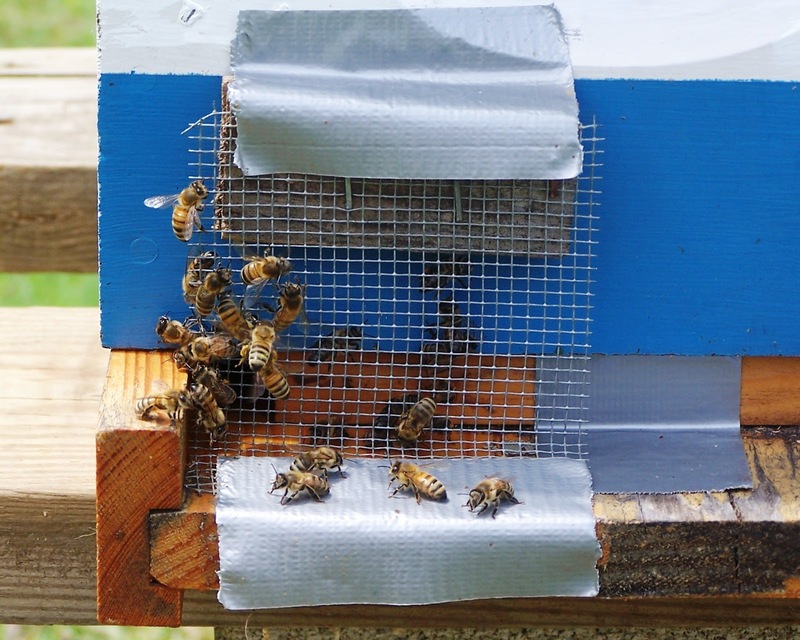 Small hive beetle traps often line the ends of bee hive frame top bars. Here, many beetles die of starvation. The bee populations of expanding colonies often fare better in small-sized hives because there is less open space for small hive beetles to move freely and lay eggs. Our experience in rearing queens and expanding colonies at Peace Bee Farm is consistent: We have considerably greater success in rearing bees in nucleus hives than in full-size hives. Today’s photo shows worker bees returning to their small, expanding colony in a queen mating nucleus hive fitted with an entrance reducer and a screen to restrict robber bees. Bees from the colony learn to negotiate the space between the screen and the hive entrance. Robbers are attracted to hive odors and fly directly toward the screen where they are challenged by guard bees poised on their hind legs. Queen bees mate in flight. In areas where Africanized Honey Bee genes are not prevalent, honey bee queens are allowed to mate with drones in the area. These “open mated” queens typically receive genetic material from between 12 and 20 drones when they fly into drone concentration areas. Having a large number of drones in the area insures that the queens will pass along to their offspring a great number of traits for survival in a rapidly changing environment. Beekeepers can increase the number of drones with desirable traits available to mate with queens by increasing the amount of drone comb in hives with favored traits. 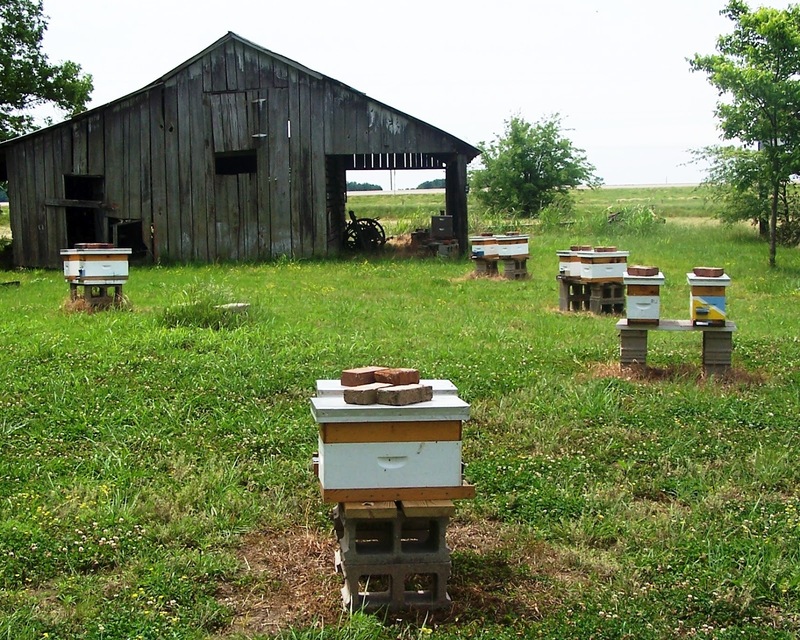 By adding frames of drone brood foundation, beekeepers can designate certain hives as “drone mother” hives. The process of drone saturation can lead to improved genetics throughout the bee yard when new queens are reared by the beekeeper or when colonies naturally supersede their queen. New queens are being reared in mating nucleus hives as shown in today’s picture. The queens emerge as adults on day 16 after rapidly progressing through the stages of egg, larva, and pupa. After waiting five or six days in the hive in which their reproductive organs continue to develop, virgin queens make mating flights. It is important that the queens return to their own hive; they will be killed if they wander into another hive. The beekeeper can help insure the queens find their proper hive by randomly placing the hives and altering the hives’ appearance with paint color and patterns. 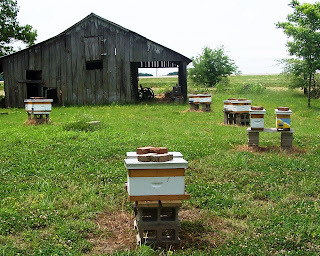 Hives here are pointed in opposite directions to allow virgin queens to orient toward a particular mating nucleus hive. After the queens return from their mating flights, they wait another five or six days while their reproductive organs continue developing before they begin laying eggs. Feeding the mating nucleus colonies throughout the two weeks of development after the queen’s emergence is important. A strong nectar flow also helps ensure the queens receive adequate nutrition during their development. A honey bee colony can’t be any better than its queen. We evaluate queens by observing the traits of the entire colony. Strong, healthy colonies reproduce by swarming in the spring. Beekeepers encourage bees to make new queens by setting up hives in the conditions that lead to swarming. To produce high-quality queens, it is necessary for the bees to come from good genetic lines, have good nutrition, and successfully mate with a number of high-quality drones. Shirley Murphy and I are participants in the Tennessee Queen Breeders Association, an effort of the Tennessee Beekeepers Association to develop queen bees adapted for the conditions of the Mid-South. In today’s photo Shirley is installing a queen cell housed in a protective cage in a full-size hive that she is requeening. She presses the queen cell into the side of a frame of mixed-age brood to resemble a supersedure queen cell. Similarly, Ed Anderson cuts off extra queen cells from his best Hendersonville, Tennessee bee hive to requeen another hive. Their queens will emerge inside the hives. After they make their mating flights, they will likely replace the old queens in mortal fight between the queens. Most colonies will accept any queen that emerges as an adult within the hive. Shirley is also adding queen cells to queen mating nucleus hives. A “nuc" is any hive with less than the full capacity of a bee hive. Nucs often hold three, four, or five frames. We made up five-frame nucs with two frames of mixed-age brood and nurse bees from strong hives. The nurse bees will feed and care for the larvae in the open cells. The pupae in the capped brood will emerge soon to provide young worker bees to care for the new queen when she emerges from her queen cell. For food, we include in the nucleus hive a frame of honey and a frame of pollen. One empty frame of drawn comb provides for expansion of the prospective colony.